FBI Details Case Against Anthrax Suspect Hundreds of pages of documents, search warrants and other court records show that the late Bruce Ivins was deeply troubled, but the evidence is largely circumstantial. 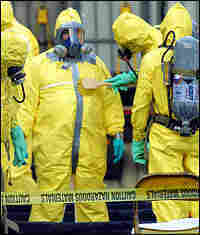 Officials said Ivins was the "custodian" of a specific anthrax strain that was used in the 2001 attacks that killed five people. More Court Documents Released By The Justice Dept. 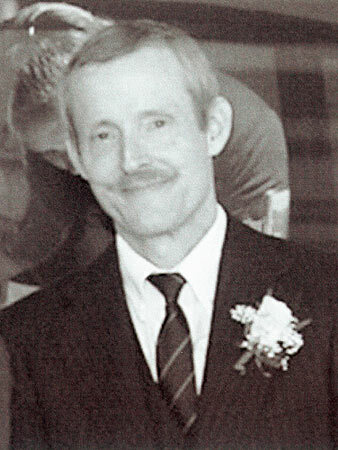 Bruce Ivins, a government biodefense researcher, is seen in a 2003 photo. The scientist, who was a suspect in the 2001 anthrax attacks, committed suicide late last month. (1) At the time of the attacks, he was the custodian of a large flask of highly purified anthrax spores that possess certain genetic mutations identical to the anthrax used in the attacks; (2) Ivins has been unable to give investigators an adequate explanation for his late night laboratory work hours around the time of both anthrax mailings; (3) Ivins has claimed that he was suffering serious mental health issues in the months preceding the attacks, and told a coworker that he had "incredible paranoid, delusional thoughts at times" and feared that he might not be able to control his behavior; (4) Ivins is believed to have submitted false samples of anthrax from his lab to the FBI for forensic analysis in order to mislead investigators; (5) at the time of the attacks, Ivins was under pressure at work to assist a private company that had lost its FDA approval to produce an anthrax vaccine the Army needed for U.S. troops, and which Ivins believed was essential for the anthrax program at USAMRIID; and (6) Ivins sent an email ... a few days before the anthrax attacks warning that "Bin Laden terrorists for sure have anthrax and sarin gas" and have "just decreed death to all Jews and all Americans," language similar to the anthrax letters warning "WE HAVE THIS ANTHRAX . . . DEATH TO AMERICA . . . DEATH TO ISRAEL." A member of a hazardous-materials response team uses a brush to decontaminate a colleague outside a post office in West Trenton, N.J., Oct. 25, 2001. The facility was closed after letters containing anthrax were traced back to the facility. The Justice Department on Wednesday said Army microbiologist Bruce Ivins was "the only person responsible" for the deadly 2001 anthrax attacks. Justice officials unsealed 14 search warrants and affidavits, outlining a damning but still largely circumstantial case against Ivins, who committed suicide late last month. When asked about the strength of the case and their seeming certainty of Ivins' guilt, U.S. Attorney for the District of Columbia Jeffrey Taylor replied, "Circumstantial evidence? Sure, some of it is. But it is compelling evidence." Ivins' attorney, Paul Kemp, said the evidence is anything but compelling and attacked not only the accuracy of the government's findings, but its very focus on Ivins, a suspect whose death now prevents either side from proving its case once and for all. "The idea that anyone could say they could convict someone with what they have is stunning," Kemp said. "They have nothing. There was not a single piece of evidence produced from all those search warrants and all those affidavits. He was a weird, bookish, nerdy kind of man. But he didn't do it. He was an open, caring, honest man with a great sense of humor who was beloved by his friends and family." The case against Ivins largely rests on new scientific techniques that investigators believe directly link the anthrax used in the attacks to Ivins. According to the documents, genetic analysis of the spores show they match a batch of spores from the Army's lab at Fort Detrick, Md., and that Ivins was the "custodian" of them. Taylor said Ivins was one of fewer than a dozen people in the country with the knowledge, capability and equipment necessary to pull off the attack. He said the flask investigators recovered from the lab was the "parent flask" of the anthrax that was sent through the mail, and he said that flask belonged to Ivins. Taylor called the flask "the murder weapon." But on Wednesday, Kemp countered that hundreds of people had access to the flask and that the science behind the investigation is not as solid as it is being made out to be. He also added that Ivins cooperated with the investigation every step of the way. Kemp says Ivins never denied to the FBI that the anthrax could have come from his batch. Ivins was restricted from the lab on Nov. 1, 2007, some six years after the attacks, according to an Army spokesperson. What both Kemp and Justice officials agree on was that Ivins was struggling with his mental health. But they disagree as to the extent and relevance of his mental state. The documents reveal a man deeply troubled for many years. The records show he sent an e-mail to someone he knew a few days before the attacks warning that "bin Laden terrorists for sure have anthrax and sarin gas" and have "just decreed death to all Jews and all Americans." The language is strikingly similar to the warning scratched across the anthrax letters, which said, "We have this anthrax ... Death to America ... Death to Israel." Ivins told a co-worker he was suffering from serious mental health troubles, saying he feared he might not be able to control his behavior. A couple of months after the attacks, Ivins sent an e-mail to someone he knew, which included several poems he wrote about himself. One said: "I'm a little dream-self, short and stout. I'm the other half of Bruce — when he lets me out. When I get all steamed up, I don't pout. I push Bruce aside, then I'm free to run about." In an earlier e-mail, Ivins talked openly about his depression and paranoia and seeking help. In 2000, he wrote: "The thinking now by the psychiatrist and counselor is that my symptoms may not be those of a depression or bipolar disorder, they may be that of a 'Paranoid Personality Disorder.' "
Kemp says Ivins "had mental troubles. But he always sought treatment for them. He was aware of his mental state, and he sought to correct it and took medication for it. He never denied it." Taylor described Ivins as "a prolific letter-writer," who often sent mail under assumed names and from post office boxes. Taylor said Ivins mailed more than 68 letters to Congress and media organizations alone, the two targets of the deadly letters sent through the mail. The documents also reveal a sudden "spike" in Ivins' after-hours activity at the lab where the bacteria were stored in the weeks leading up to the attacks. Officials say when they asked Ivins why, he said only, "Home is not good." Kemp says the government is mischaracterizing the "spike" and that over the course of his years working at the lab there were numerous instances when Ivins worked late. Kemp says Ivins also gave investigators information about the work he was doing that kept him there. The documents do not fully explain why a man so beloved by his friends and co-workers would want to kill people with lethal bacteria. But the FBI asserts in the documents that Ivins was under pressure to help a private company produce an anthrax vaccine and that the company had just lost its Food and Drug Administration approval, suggesting he might have been trying to make the anthrax threat more pressing and real. There were parts of Ivins' life that were unusual, including his apparent fascination with the sorority Kappa Kappa Gamma. The government described this interest darkly, as an obsession that dated back 30 years. "I like individual Kappas enormously, and love being around them. I never choose an enemy, but they've been after me since the 1960s, and REALLY after me since the late 1970s. At one time in my life, I knew more about KKG than any non-Kappa that had ever lived." But Kemp says Ivins was merely interested in the idea of secret societies in the past, never had any obsession with any of the women and told investigators about the old interest freely. Taylor said investigators had called Kemp recently to set up a meeting to outline their case against Ivins. But before the meeting could take place, Ivins committed suicide. At Ivins' memorial service Wednesday, an Army official said a couple hundred people showed up at the Fort Detrick chapel for an hourlong service. Many were crying, and four colleagues spoke about him being a brilliant scientist, a mentor with a quirky sense of humor. They also talked of his scientific accomplishments and sang "Amazing Grace" at the end. Taylor said Ivins' statements were inconsistent over time and failed to explain the evidence against him. He said, "We are confident that Dr. Ivins was the only person responsible for these attacks." Now that Ivins is dead and the evidence will never be evaluated in court, there will always be some doubt as to whether that is in fact the case. This story was reported by NPR staffers Dina Temple-Raston, Ari Shapiro, Laura Sullivan, David Kestenbaum, Nell Greenfieldboyce, Allison Keyes, Tom Bowman and Katia Dunn. It was written by Laura Sullivan.